Philadelphia, PA – Today, as part of his “Jobs That Pay” initiative, Governor Tom Wolf announced a proposal to strengthen the middle class by modernizing Pennsylvania’s outdated overtime rules to increase the pay of nearly half-a-million people to ensure they are compensated fairly for their hard work. “Pennsylvania’s overtime rules haven’t changed in more than 40 years and workers are paying the price,” said Governor Wolf. “I am taking this action to ensure hundreds of thousands of Pennsylvanians who work more than 40 hours a week for the same job receive the overtime pay they have earned. 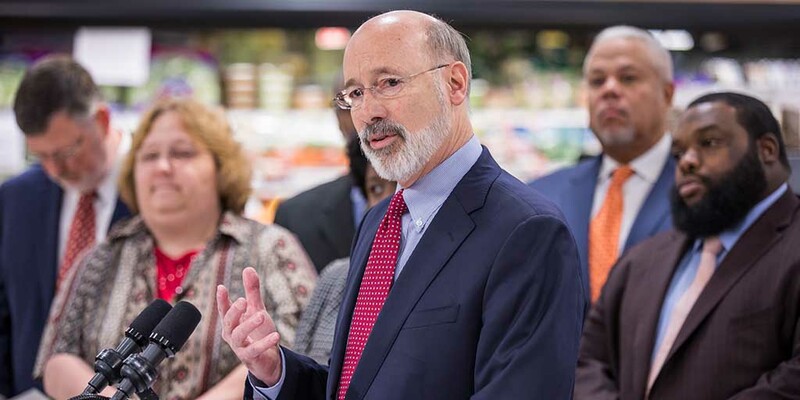 Governor Wolf made the announcement at The Fresh Grocer of Grays Ferry in Philadelphia, where he was joined by legislators, local elected officials, store management, staff, and local workers, who were quick to praise the governor’s announcement. The middle class is built on the idea of hard work and fair pay, but workers in Pennsylvania have not received a minimum wage increase in nearly a decade and overtime rules established in 1977 have not kept up with inflation. Many hardworking Pennsylvanians are not getting the overtime pay they deserve. Because the overtime rules have not been updated, employees are covered by an exemption to overtime that was intended for high-wage, white-collar employees more than 40 years ago. As a result, a salaried worker earning up to $24,000 a year, which is below the poverty line for a family of four, can work more than 40, 50, 60 or more hours a week and is not guaranteed overtime at time-and-a-half. At the direction of Governor Wolf, the Department of Labor & Industry is finalizing a plan to modernize rules and clarify requirements. The new rules will phase in over four years to increase the salary threshold that requires employers to pay overtime to most salaried workers. “This long overdue moment for thousands of struggling, hard-working employees in the 8th senatorial district and across Pennsylvania is saying this really is a happy new year,” Sen. Anthony Williams said. When fully implemented, modernizing overtime rules will increase the wages of an estimated 460,000 workers in Pennsylvania. That will lead to a stronger middle class. When workers earn more, they spend it in their local communities, which helps grow the economy throughout the state. The Department of Labor & Industry anticipates releasing the proposed to update the regulations for public comments in March.